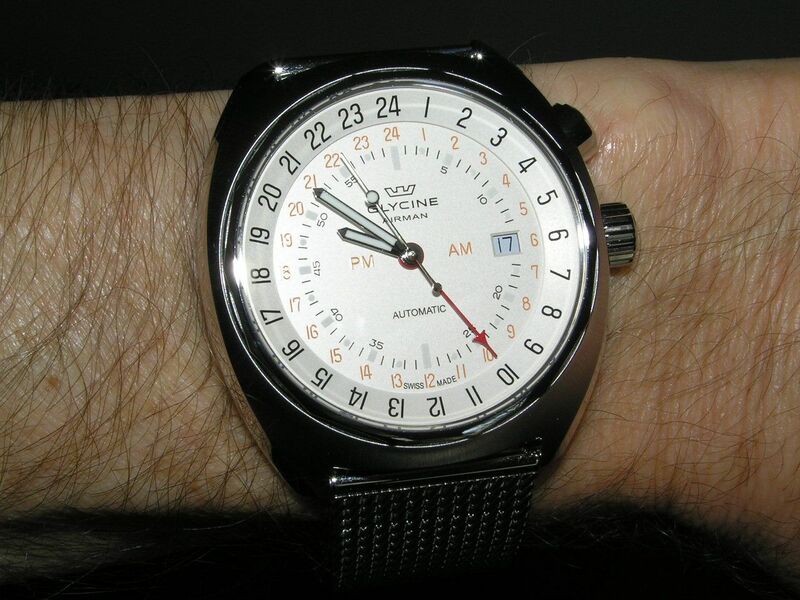 About two years ago, the Invicta Watch Group purchased the Swiss watch company Glycine, presumably to give themselves more of an ‘in’ with the genuine Swiss-made watch market and because many Swiss makers are struggling these days and I’m sure the price was right. 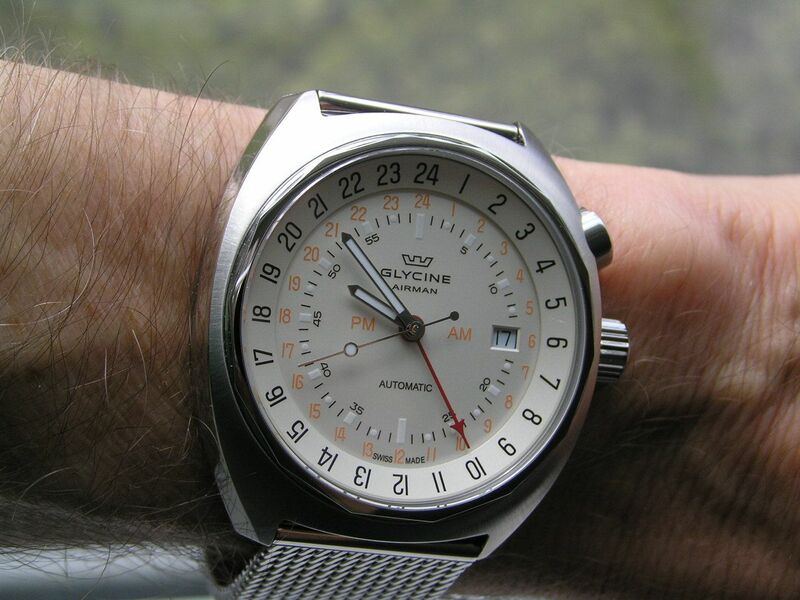 I won’t go into the whys and maybes associated with the acquisition, but I am glad that since the deal was done, existing stocks of Glycine watches have gone down in price and can be had at ‘steal’ prices at many retailers online. 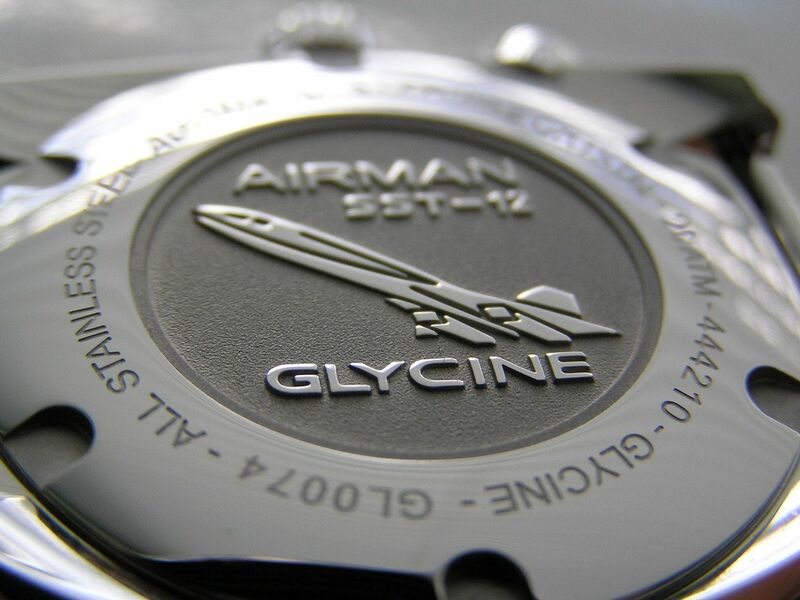 Glycine was founded in 1914 and was for the majority of time a small, independent watchmaker that made its name with the iconic Airman series of 24-hour and GMT pilot watches that made their debut in 1953. There are far too many variations of the Airman line to dissect here, but if you’re looking for a true GMT watch that can track up to three timezones at once or a true 24-hour format watch with GMT capability, look no further than the Airman. I have previously owned a 24-hour format Airman (the hands make one full rotation every 24 hours instead to two (a.m./p.m.) and it was a nice piece (reviewed by me on this blog, May 2012); I just never warmed up to nor needed the 24 hour format. As I do enjoy a watch with a GMT complication, I’m always looking for another one to add to my collection and when the Airman SST that is the subject of this review popped up at a great price, I pulled the trigger and haven’t looked back, as it’s a superb piece. 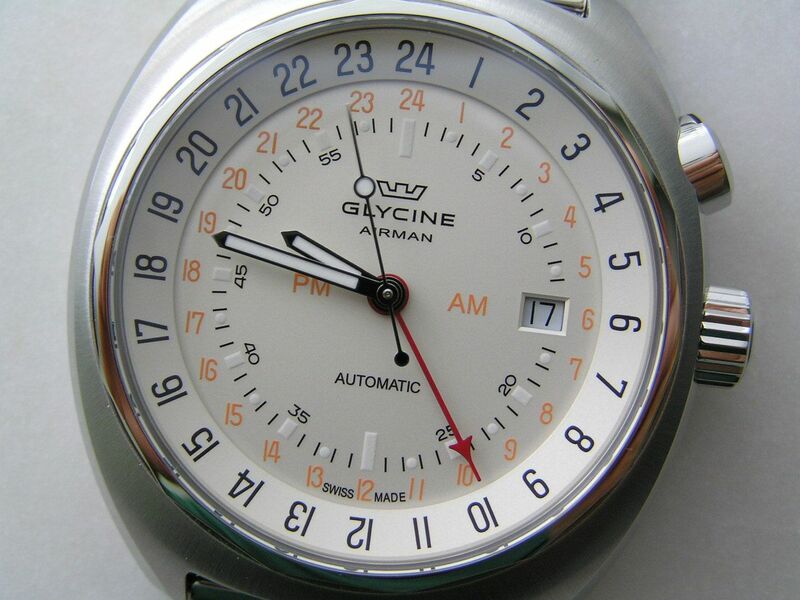 And before we go any further, I wanted to make it clear that this model of Airman is a standard 12-hour timepiece, with a.m. and p.m. cycles and is part of Glycine’s ‘Vintage’ Airman series. 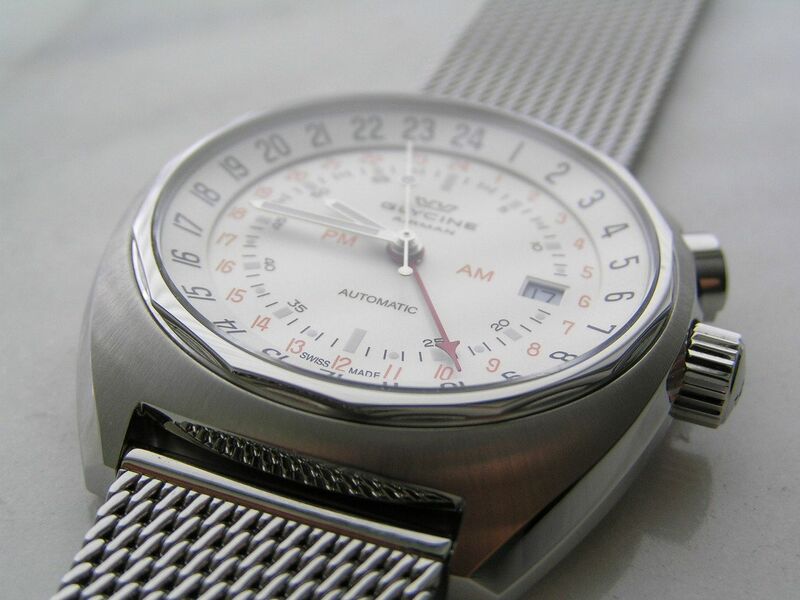 The Glycine Airman SST-12 starts with a stainless steel cushion-style case that is polished on the sides and finely brushed on the top. 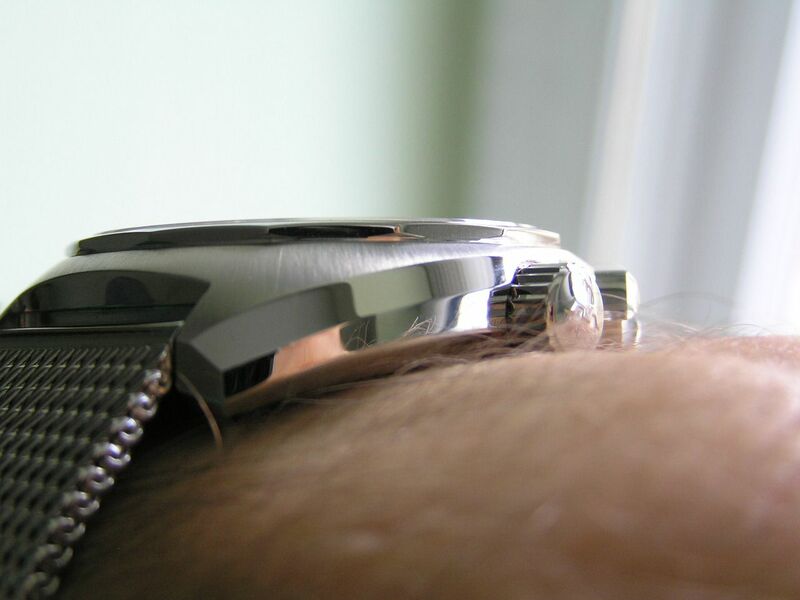 The case measures about 42.4mm without the perfectly sized signed and screwdown crown; 46.7mm crown inclusive. 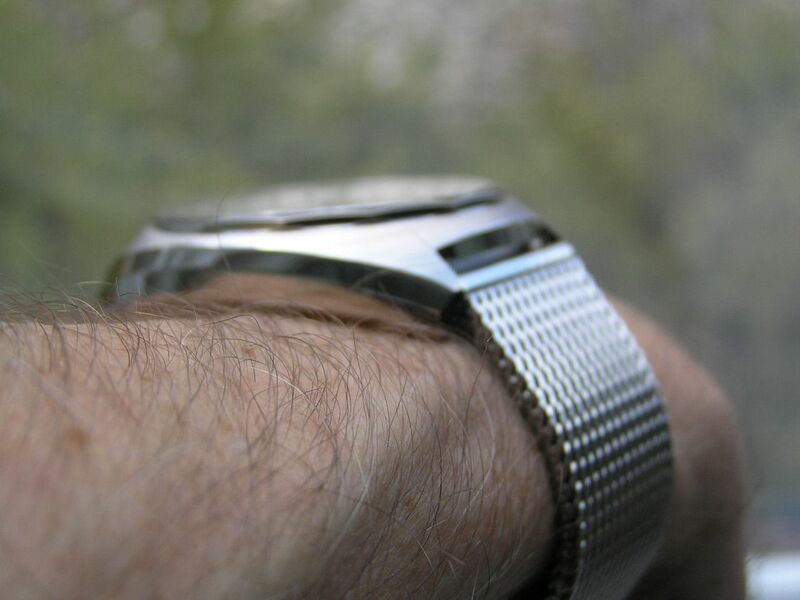 Overall height is 46.4mm which makes for a nice placement on the wrist. The curve of the case hugs the wrist extremely well. Case thickness is a relatively svelte 11.1mm with lug spacing at 22mm. 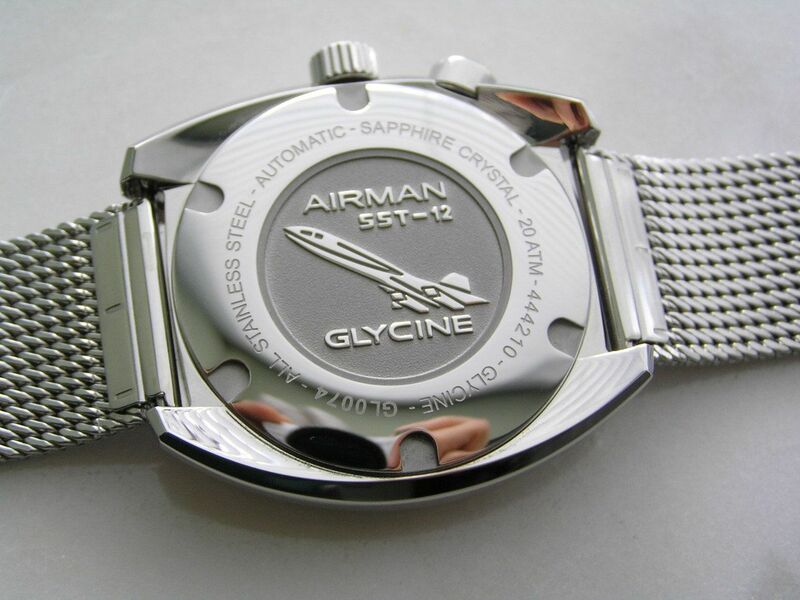 The polished caseback screws down and displays a beautifully embossed design of a supersonic Concorde jet with a polished relief and a satin grey background. Super cool. The crown at three is the watch setting crown, which is signed and screws down with about four full turns. The crown is a bit wobbly when fully extended, which is a bit odd, but it never feels like it’s about to fall out. 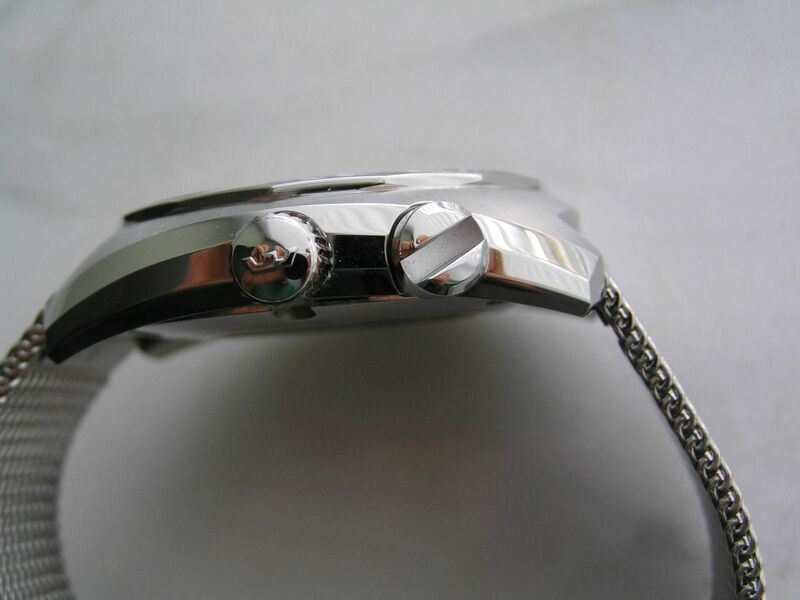 There is also a screwhead slotted crown at the two position, which is used to turn the inner 24-hour rotating bezel. This crown is very stiff, so once it’s moved to the desired position, it will stay put. 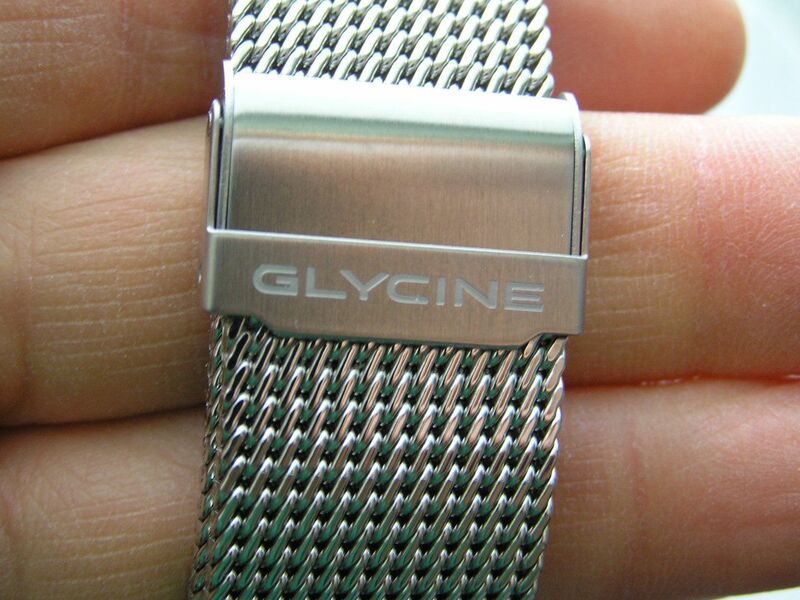 Glycine supplies a nickel-sized ‘coin’ that fits into the slotted crown to rotate the bezel (see photo). You could use something else, but this ‘coin’ fits perfectly and looks pretty cool as well, as it’s emblazoned with the Glycine name and SST nomenclature. 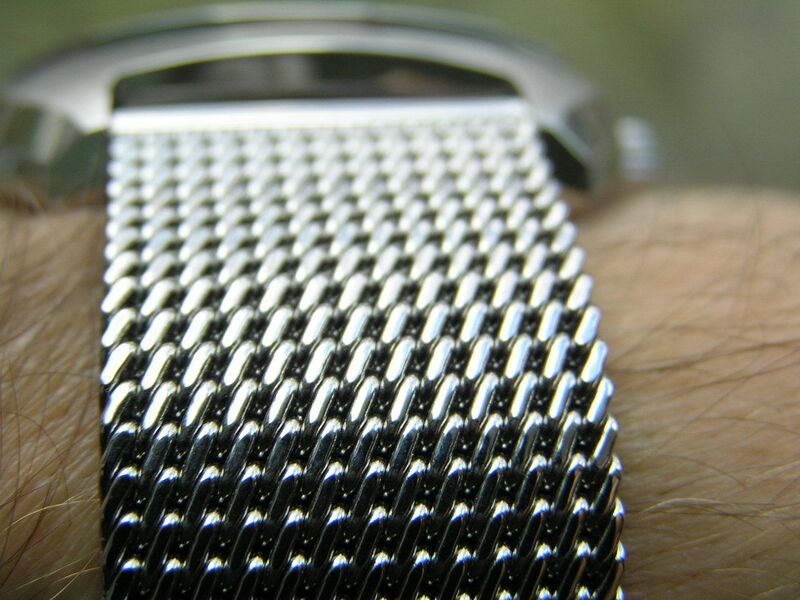 Fit and finish on the watch is strong, and the quality of the mesh bracelet (to be discussed shortly) is great. This watch is very comfortable to wear, in part due to the very comfy bracelet. 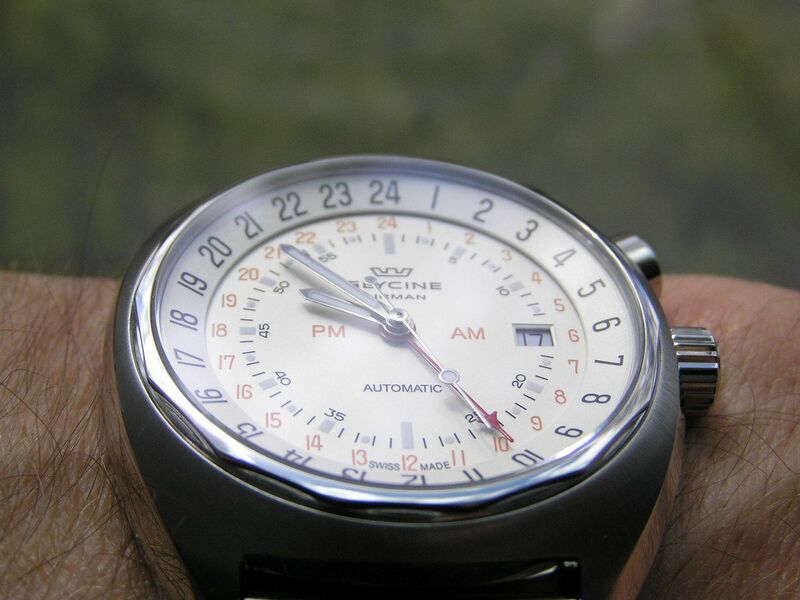 The Glycine Airman SST-12 is factory rated for 20 ATM of water resistance. Part of what drew me to this particular model Airman is the color of the dial. 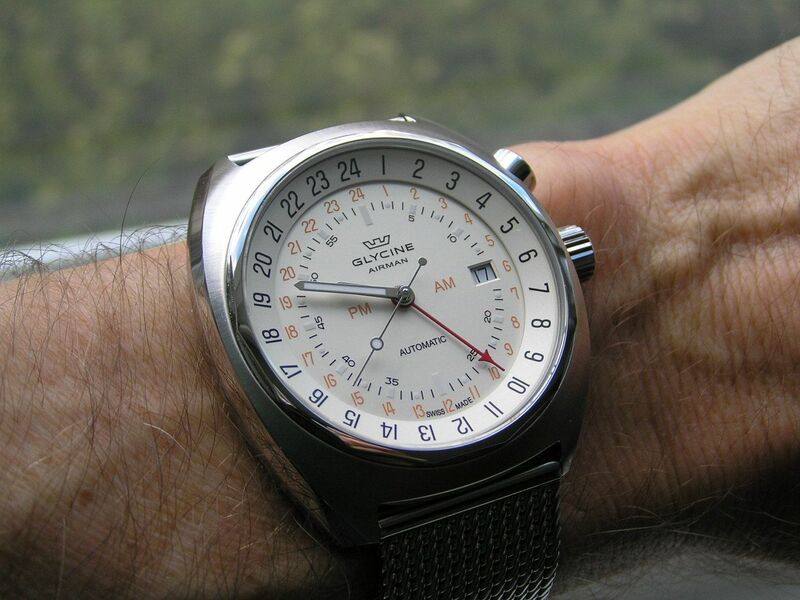 I’m one of those watch guys that dig lighter color dials, like white, ivory and cream and while the dial on this watch is not entirely one of those shades, it is close, more like silvery cream. It’s a very pleasing hue. While the dial might look plenty busy with all the arabics on it (and regular readers will know I don’t like overly busy dials) this watch is actually very legible and not confusing to look at. The outer track of the dial is a 24-hour chapter ring with orange numbers, with another 24-hour ring with black numbers that is the inner rotating bezel controlled by the screwhead slotted crown at the 2 o’clock position. On the inside of the first chapter ring are hash marks for the seconds and standard arabics every five minutes, both in black. Lumed rectangles are also positioned above each of the black arabics, with small lume dots between each five minute arabic. 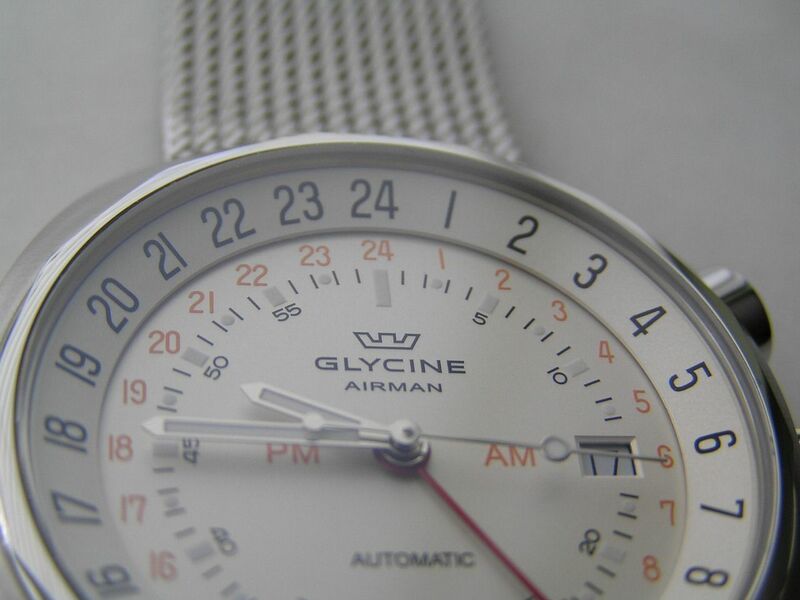 Below the 12 position is the Glycine crown logo (printed, not applied), ‘Glycine’ and ‘Airman’ all in small black type. Other than a small ‘Swiss Made’ at the bottom of the dial, there’s also ‘Automatic’ above the six position and small AM and PM markings in orange (AM on the center right and PM on the center left. I know this dial sounds like there’s a lot going on, but trust me, it all works together nicely. And remember, all this info on the dial means you can track three timezones at once. The hands are simple stick style, done in silver with inset lume. 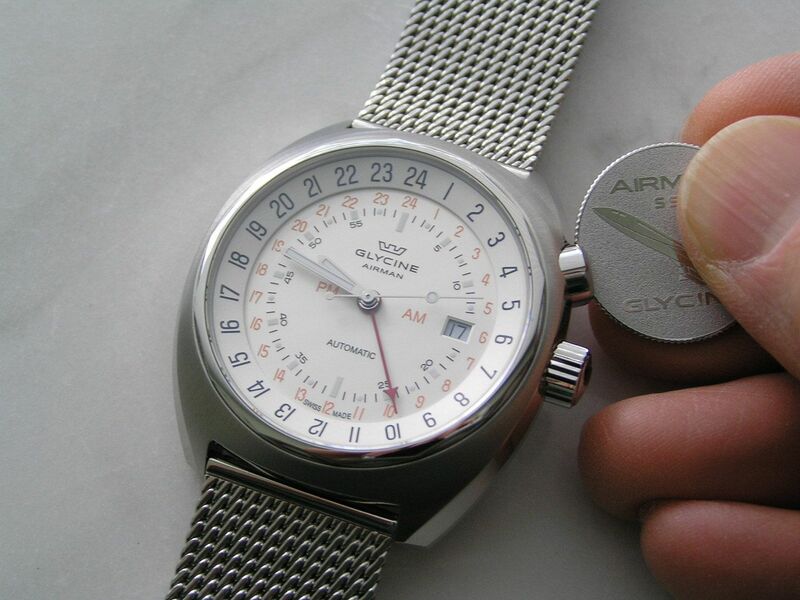 The seconds hand is a simple silver stick as well, with a lume ball about two-thirds of the way up. A red arrow-style GMT hand extends all the way to the inside of the 24-hour rotating track. 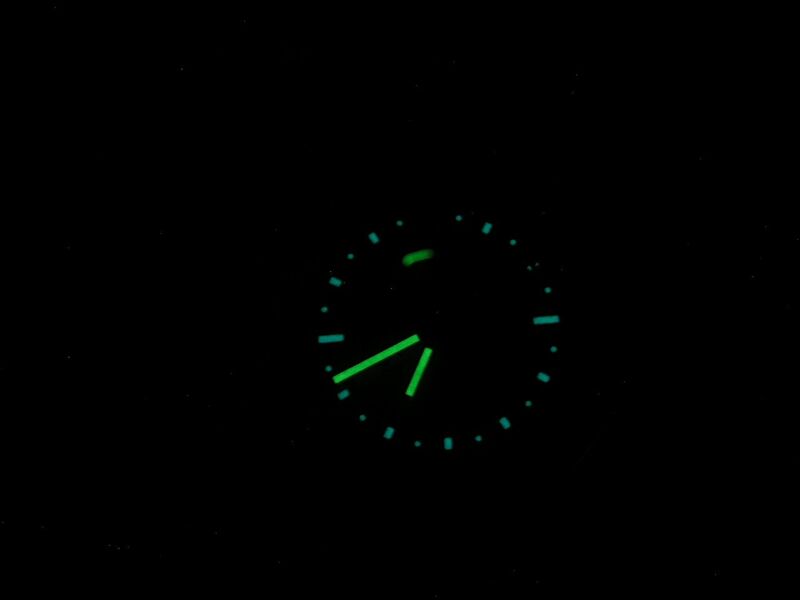 While there’s not an abundance of lume on this watch, what there is appears to be of good quality. The hands glow green and the rest of the markers are a green-blue. A quickset date is at the three position, with a black on white date wheel. Alignment of the date wheel in the window is fine and the quickset date mechanism functions perfectly. 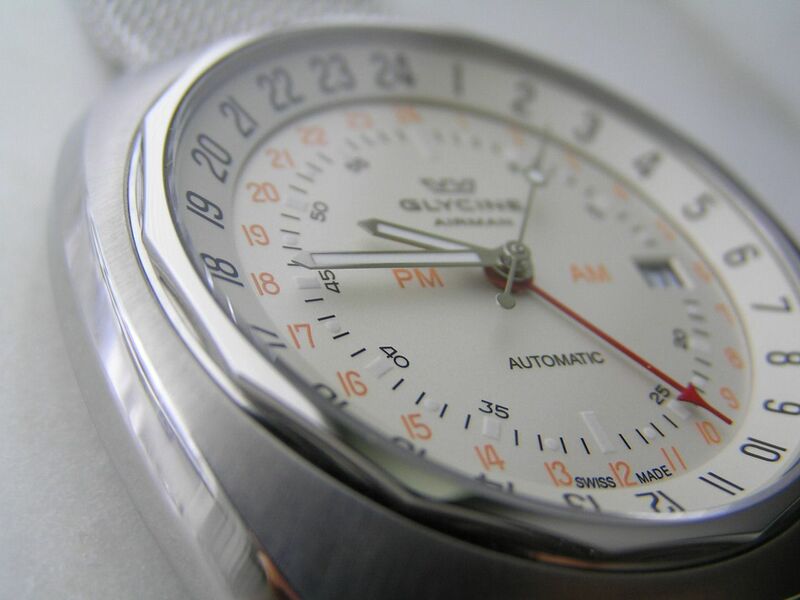 A flat sapphire crystal caps the dial with three layers of anti-reflective coating on the underside. There is also a fixed polished bezel (really more of a thin ring or rim) that has 14 sides to it and pretty much blends into the case and doesn’t stand out or distract. One small nit to pick (at least to my fussy self) is that this bezel could be aligned a smidge better, so that the flat part of one of the sides is even with the top of the watch. As you will see if you look closely in my pictures that it’s every so slight crooked, but most people won’t notice it or be bothered by it. It doesn’t bug me, but I wanted to make mention of it nonetheless. Inside the Airman SST-12 is the venerable ETA 2893-2 Swiss made automatic movement (Glycine caliber GL 293 with decorated Glycine rotor). 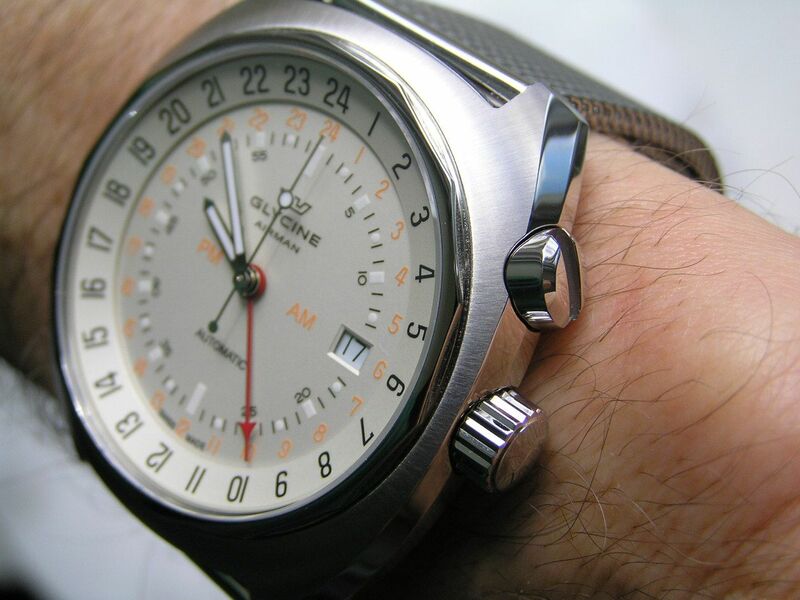 This is a great movement, proven in many different brands of watches and keeps great time. The GL 293/2893-2 runs in 21 jewels and beats at 28,800 vph. 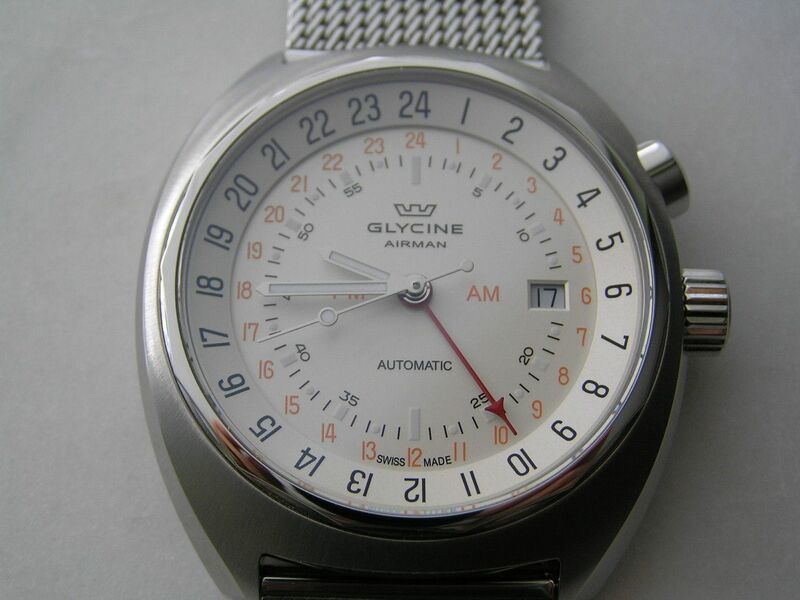 I have read that due to the case size on some of the Glycine Airmans that there is a spacer to have the movement fit properly inside the case, but seeing that the caseback is solid on this watch and I don’t want to open it up to look, I will leave it at that. Besides, spacers don’t bother me as they seem to do some people. The GL 293 inside my Airman winds silently and sets properly, hacks and keeps outstanding time. During testing in my atelier, it ran at +1 second over 24 hours in the crown up position, and also keeps this excellent time on the wrist as well. Outstanding! Power reserve is equally impressive, clocking in at 50 ¼ hours of run time on a full wind. 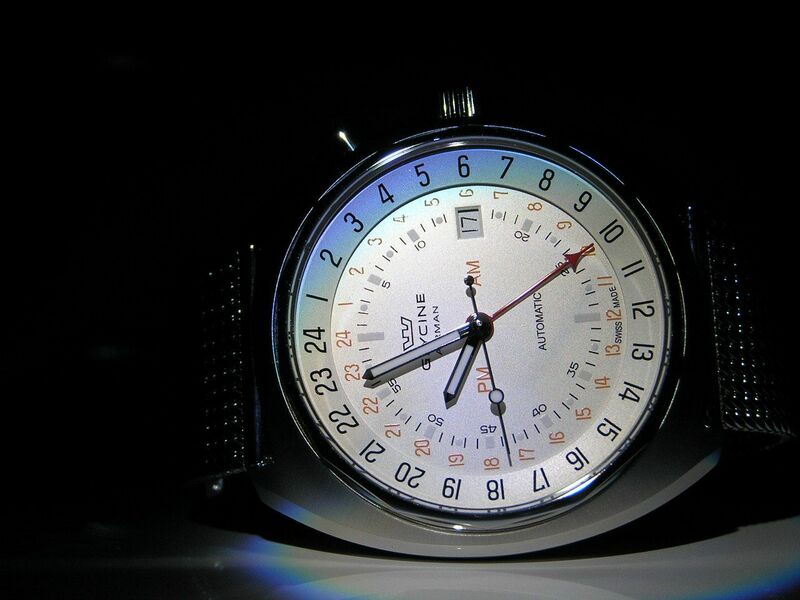 As with all ETA 2893-2 movements, the third GMT hand sets with the crown in the date setting position. You rotate the crown up (clockwise) to set the GMT hand in one hour increments. Overall, I have zero complaints about the engine in the SST-12 and it should provide years of reliable, accurate timekeeping. 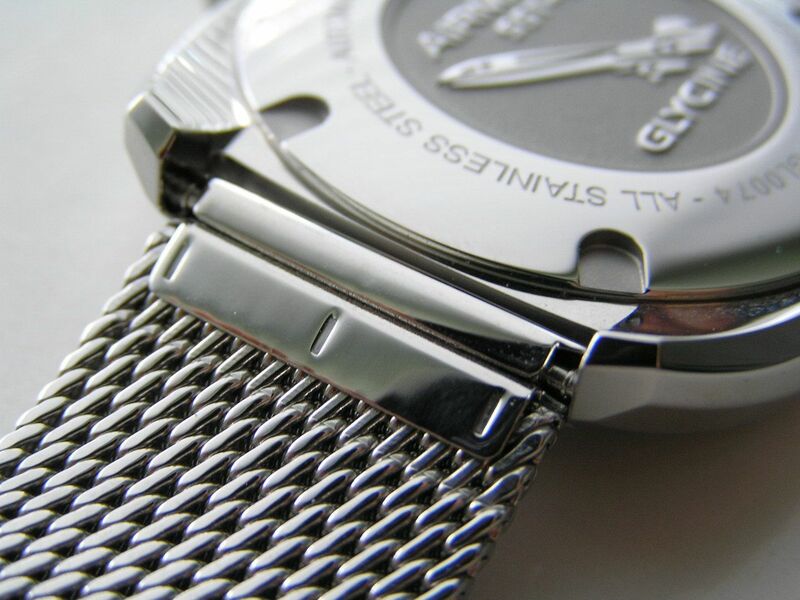 Another design feature of the SST-12 that attracted me to this watch is the inclusion of a mesh bracelet. 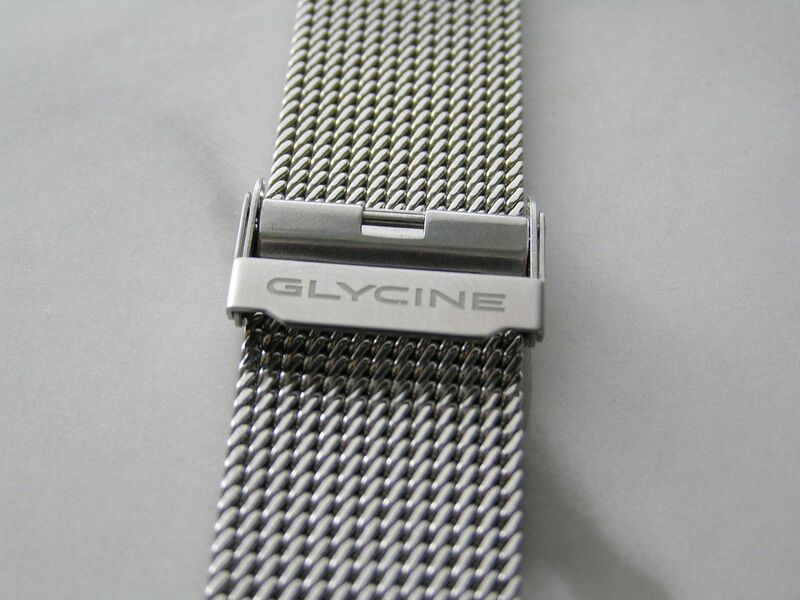 As many WISes know, mesh bracelets come in a wide variety of styles and adjustment schemes. 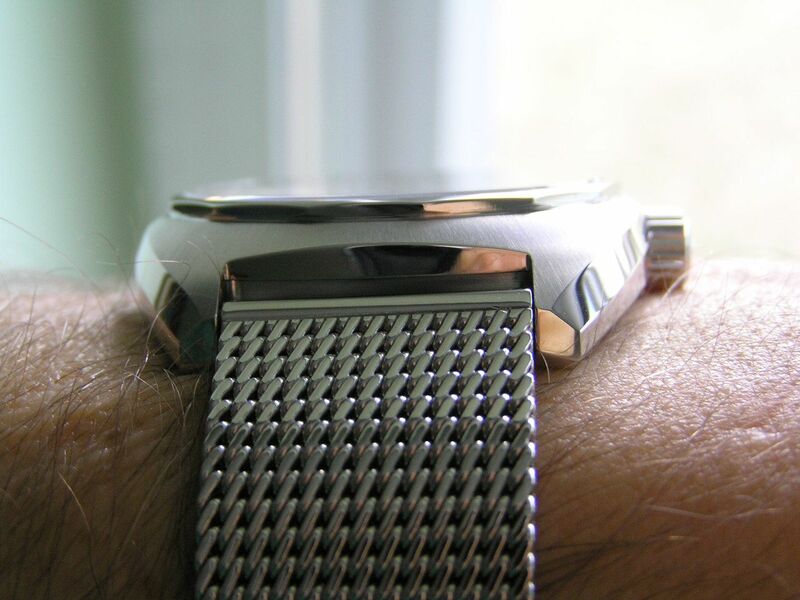 This is a finer style mesh (fine chainmail or milanese type) that looks great and gives a dressier feel to this watch. The bracelet is finely polished, but not glaringly so, and is fairly flexible so fitment is not a problem. The bracelet is 2.5mm thick. 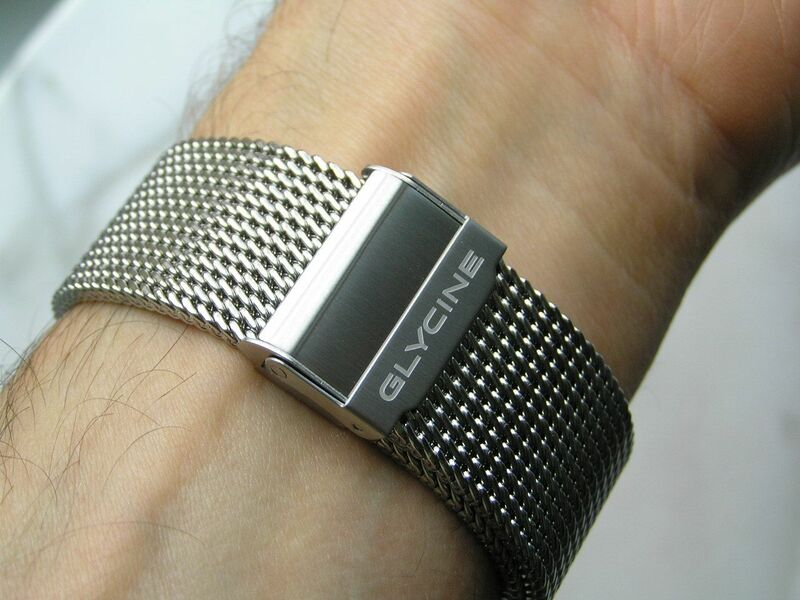 The bracelet measures 22mm at both the lug and clasp ends. The lug ends are nicely capped where the spring bar fits through and the clasp is a signed double locking type. 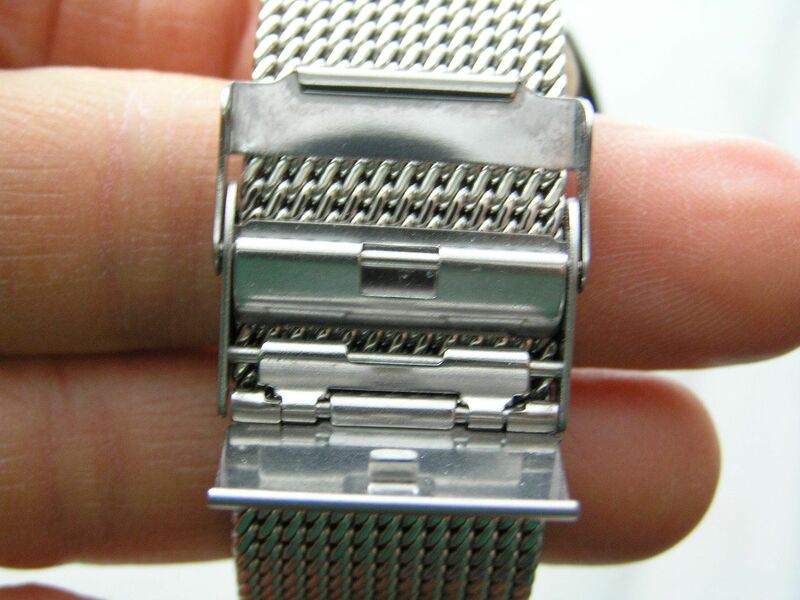 What I particularly like about this style of mesh is that there are no links to remove, you simply release the ‘lock’ or clamp on the inside of the clasp and slide the opposite end of the bracelet through the clasp to the desired fitment and re-secure the clamp, no muss or fuss for a perfect fit. The bracelet is comfortable and does not pull any hairs. Presentation is standard, a black cardboard outer box with the Glycine logo and a black inner box with the instructions and warranty in a separate envelope. A clean and straightforward setup. 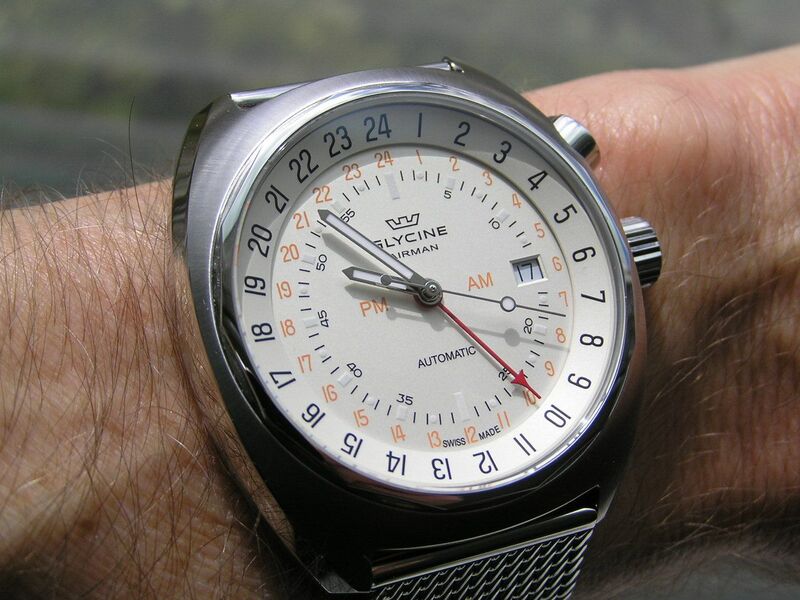 I have owned several Glycine watches over the years and have always found them to be quality pieces with some unique design elements and this Airman SST-12 is no exception. For one, it’s not a watch that you see every day, even with the storied history of the Airman line. This watch is well built, keeps exceptional time and has very useful timezone tracking features for those who need such a feature, or those like me that just think it’s a cool watch that looks great and has some history behind it. Grab one while you can and enjoy it to the max. 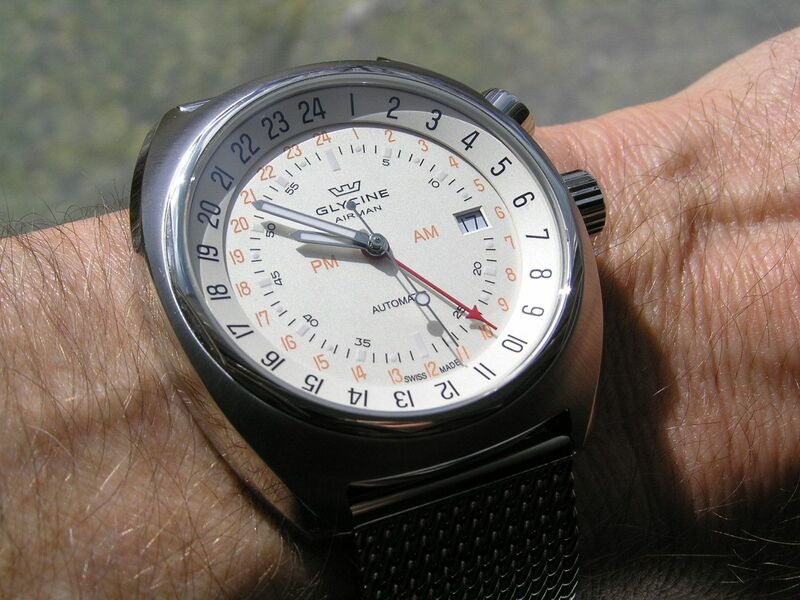 Verdict: it doesn’t get much more iconic than an Airman from Glycine, no matter with flavor you choose, an excellent choice for pilots or anyone who wants a GMT watch with a story and one that will deliver the goods year after year. Simply a superb watch!